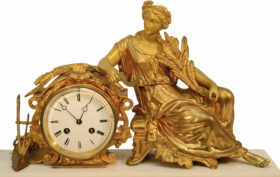 This superb French gilt bronze mantel clock rests on an elegant Carrera marble base. Upon the base gracefully sits a figure of Demeter, famed in Classical mythology as the Goddess of Agriculture, done in beautiful detail. 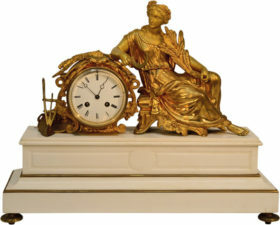 This clock houses an 8 day movement with bell strike and a porcelain dial.